What was the first Opera you saw and what impression did it make on you? The first opera I saw was when I was 18 and it made a huge impression on me, although ironically I cannot remember the name of the opera! I was working as an au pair in Italy and my love of music and singing was noticed by the parents who then give me a ticket to the opera (La Scala no less, although at the time I didn’t realise that it was the most famous opera house in the world). I had never been to an opera in my life and I wasn’t really interested in classical music, also, I had only started to learn Italian so I was very intimidated going there. As the opera developed all my inhibitions were transcended by the wonderful singing and the fantastic orchestra. To experience something like that for the first time is incredible. I remember sitting there and watching a soprano and saying to myself “this is what I want to do” so you could say my first experience of an opera was actually a life changing moment. You started singing lessons quite late in life at 18. Do you think this gave you an advantage or a disadvantage over other singers? I took my first singing lesson at the age of 19 and my journey has not been an orthodox one. I wouldn’t say it was an advantage or disadvantage I just think that life presents opportunities and if you work hard and avail of every opportunity, added to a bit of luck then things happen. 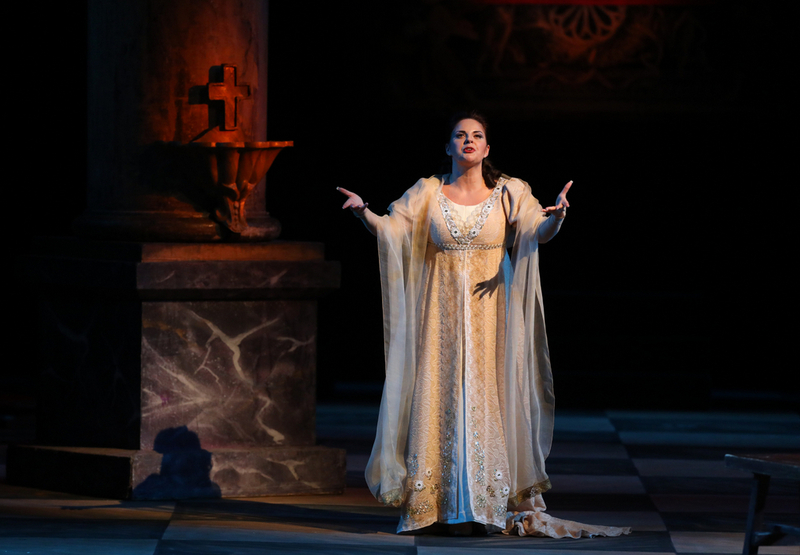 Have you performed in Tosca previously? My performance of Tosca with the Mikhailovsky Theatre will be my third production in this role. 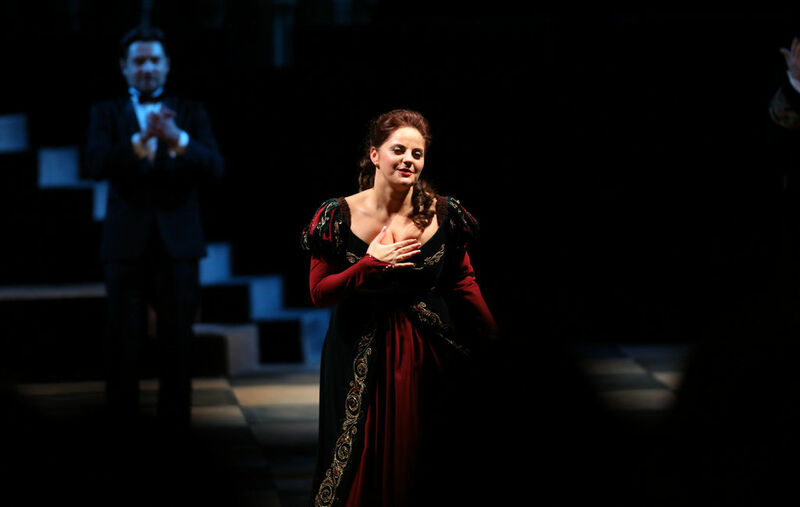 I really enjoy playing the role of Tosca, a famous singer in the stereotypical Diva mode. True of heart but relentlessly jealous. My first production was a new co-production with Opera Ostfold & Norwegian National Opera, my second was just recently in Salzburg, also a new production, and this Tosca, a revival, is my favourite of all three. I love this production as it is a “traditional” production with period costumes and the set is beautiful. Puccini’s music allows me to convey my emotions through the beautiful and passionate way the vocal line is written as Puccini had an incredible gift for scene-setting in order to achieve the perfect musical environment for the dramatic situations provided by his librettists. He was a brilliant master of orchestration and he used every colour from the orchestral instruments he had at his disposal in order to get the right effect. Tell me about your daily routine when you are performing? What do you have to do to look after your voice? As a singer it’s important to look after my physical and mental well-being given the fact that my instrument is in my body. It’s not like a violin that I can take out and put away each time to practice. I need to keep healthy. The two most important things are to keep hydrated and get plenty of sleep because if you sing on a tired voice it can damage your vocal chords and that would not be good, to put it mildly! What is life on tour like? Do you get to see much of the place you’re staying in, or is it just hotel rooms and rehearsals? I have been staying in hotels since the start of December and I have to say I don’t mind it so much because no matter where I go I try to make it home. I bring pictures of my family with me and also I have all my things with me. Being away from home is difficult but it is important for me to keep a healthy balance between family and work-life and I think I have achieved that, even though the last couple of months have been really busy. When I’m away my family come to see me and, if I can I go home for a few days. It’s important to me when I arrive in any new place that I get to see it. I always read up on the place I’m going to before I set off on my journey. I go to TripAdvisor for advice on restaurants and I walk around the city to get a feel of the place. When I’m working I’m normally very busy but of course there are days and times where I am free and I can utilise this to go sightseeing. I also often use my free time when I’m abroad learning music for upcoming performances or working on languages. I’m always kept busy so this is good because sometimes I get very lonely on the road. But then again this is the career I chose and I love my work. Tosca has a famous ending scene. Do you have a head for heights? Tosca flings herself from the parapet of the fortress—to her death. I have re-enacted this in many different ways. In my first production I didn’t even jump at all as I ran from the guards and an actress doubled as “Tosca” and ran up the scaffolding but the jump was made by a dummy. In the last production in Salzburg it was a modern production so instead of jumping to her death she was shot and killed by Scarpia. Scarpia traditionally dies in the second act, but in this version survived the stabbing only to be shot by Tosca, but not before he aimed his gun and shot her! This traditional production from the Mikhailovsky Theatre is true to the original story and she does jump from the fortress. High drama, but “That’s theatre darling”!